Coca-Cola, H&M and Danone are among 250 global brands pledging to cut all plastic waste from their operations – a move described by the UN as the most ambitious move to fight plastic pollution. The initiative comes as public pressure is escalating on manufacturers and retailers to cut back the surge of plastic packaging that is congesting landfills and filling oceans. The commitment was made earlier this week at the Our Ocean Conference in Bali, Indonesia. The aim is to eradicate plastic waste pollution, which is harming the seas. The Ellen MacArthur Foundation launched its New Plastics Economy Global Commitment in collaboration with the United Nations Environment Programme (UNEP). The foundation said if current trends continue, there could be more plastic than fish in the seas by 2050, as 8 million tonnes of bottles and waste fill the oceans each year, killing marine life and entering the food chain. Participating organisations will create ‘a new normal’ for plastic packaging; to start eliminating unnecessary plastics and using reusable packaging where possible, starting immediately. All have promised that 100% of their plastic packaging would be reused, recycled or composted within seven years. The signatories have also vowed to invest in innovative technology so all packaging can be recycled by 2025. The targets will be revised every 18 months and become progressively ambitious over time. “Most efforts ‘til now have been focused on cleaning up plastic pollution. This commitment is about eliminating pollution at its source,” Rob Opsomer, who leads the foundation’s New Plastics Economy initiative, explained at a press conference. 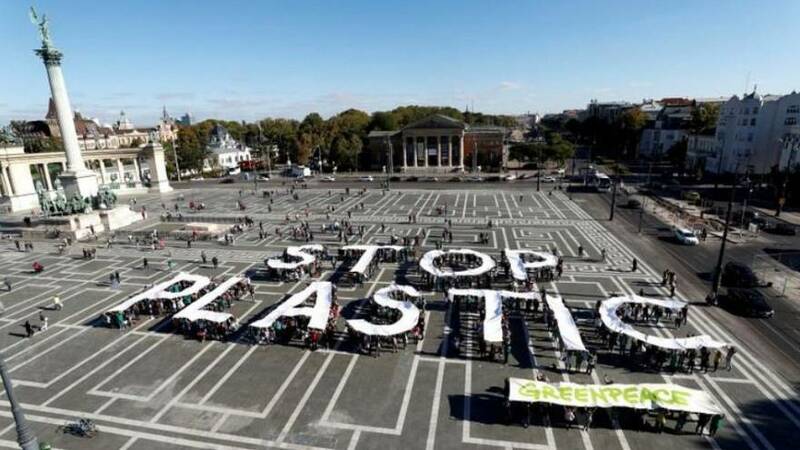 Last week, the European Parliament voted for a complete ban on single-use plastic items, including straws and cutlery, in a bid to reduce pollution. Three of the brands that signed up, Coca-Cola, PepsiCo and Nestle, were recently named the world’s worst plastic polluters, according to an index by the Break Free From Plastic movement. In the US, these three brands accounted for 64 percent of all plastic pollution identified in cleanups, according to the analysis. “We are focused on improving the sustainability of all of our packaging, regardless of the type, and increasing the amount of recycled and renewable material,” Ben Jordan, senior director of environmental policy at Coca-Cola, told the Thomson Reuters Foundation. PepsiCo said it had made a number of pledges in a bid to “build a PepsiCo where plastics need never become waste”. “Protecting our planet is hugely important to us. We are committed to achieving 100 percent recyclable, compostable or biodegradable packaging by 2025,” PepsiCo spokesman Gian-Carlo Peressutti said during a press conference.